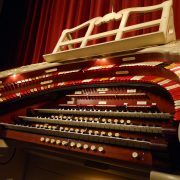 In January 2017, LCTOS established The Mighty Wurlitzer of Long Center Endowment Fund to provide for the long-range future of the great pipe organ under the management of the Community Foundation of Greater Lafayette. This partnership has now created the most exciting opportunity our organization has ever enjoyed: LCTOS is a qualified recipient of matching dollars from CFGL’s LaNelle Geddes Fund Campaign. New, individual donations of cash or securities made through CFGL on or after November 28, 2017 through August 1, 2018 — or until the Geddes Campaign monies are depleted — will be matched by 50%. For example, a $100 gift eligible for a Geddes Fund 50% match nets The Mighty Wurlitzer Fund $150. A gift of $1,000 nets $1,500; a gift of $10,000 nets $15,000. If you are among those who can take advantage of donations to nonprofit organizations for your tax benefit, there is no better time to assist The Mighty Wurlitzer Fund. 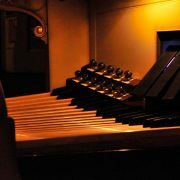 The opportunity to prepare for concerts and silent films; theatre organ presentations at Long Center events; and guarantee the future of this unique instrument for another 40 years of music-making, is now! Contributors can jump-start the organization on its way to the short-term $50,000 mark, and the long-term $250,000 goal. There are restrictions on the manner of contribution: Gifts should be payable directly to The Community Foundation (100 Main St. Ste 100, Lafayette, IN 47901) and earmarked for the Mighty Wurlitzer Fund. For more info or questions about the Mighty Wurlitzer Fund, contact Jay Mermoud or Amy Brinkley at events@lctos.org. They will happily answer your questions on gifts, eligibility, and our plans looking forward. Fund balance currently stands at $10,000. Short-term goal: $50,000 by January 1, 2019. Five-year goal: $250,000 in 2022 (the 40th anniversary of the installation of the Mighty Wurlitzer).